First of all, what is a beard trimmer? 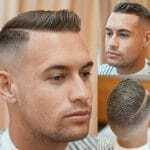 It is a type of clipper for grooming hair at lengths in-between a clean shave and haircut. As the name suggests, use them to maintain stubble all the way up to long beards. There is no one best men’s beard trimmer. It’s about finding the best one for your facial hair and grooming goals. Each trimmer has different features and attachments. 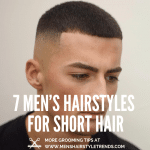 Some models have a length adjustment dial, some have attachments for manscaping, and some can be used to cut long beards or hair. It all depends on what you want to do. 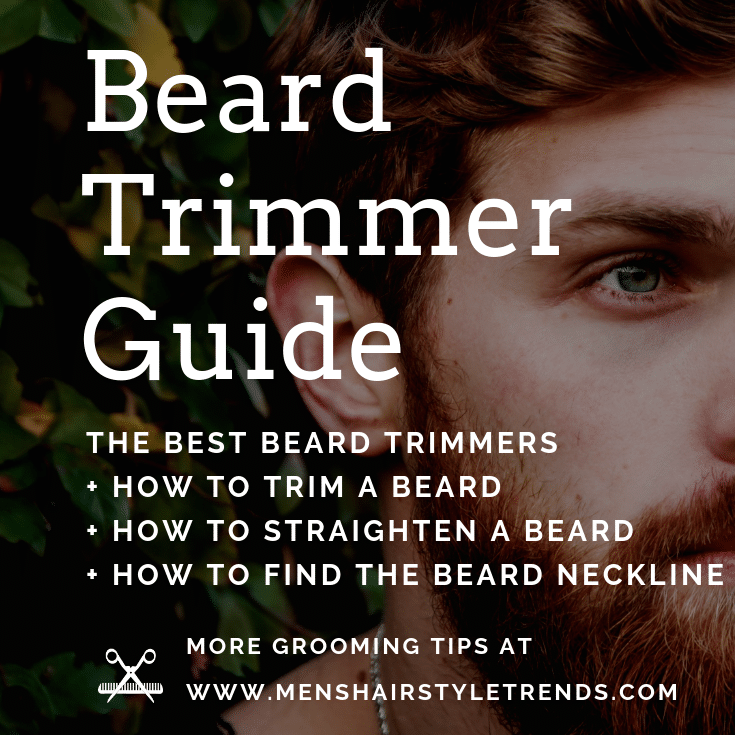 Here are some things to look for in a beard trimmer plus our picks in a number of categories. Adjustability – Beard trimmers cut in a variety of lengths from stubble to full beards. Adjustable beard trimmers change height in small increments at the flip of a switch or dial. Stationary blades use removable guards to increase length in larger sizes. 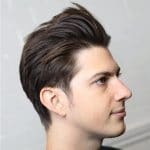 If you want stubble, opt for a trimmer with shorter options. If you have a long beard or also want to cut hair, look for longer clipper guards. Versatility – Compared to shavers, beard trimmers are meant to be adjustable in height. 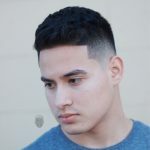 Some designs also can be used for short haircuts as well as body grooming. 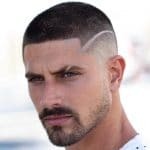 If you want to trim facial hair in addition to sideburns, brows, ears, and more, look for a device featuring additional blade sizes for detailed manscaping. 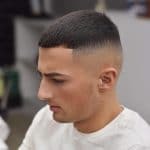 Corded vs Cordless – Most professional barbers use corded trimmers and clippers because they are more powerful. However, cordless tends to be the at-home preference because they are just easier to use. Some devices can be used both corded or cordless. For rechargeable beard trimmers, battery life can vary from under 1 hour up to 4 hours. Lithium-ion batteries will charge faster. Better batteries tend to cost more. 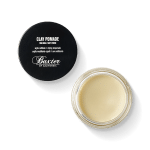 Maintenance – Caring for clippers requires cleaning and oiling. Some beard trimmers can be run under water to rinse out hairs while others can be brushed clean while dry. Most beard trimmers need blade oil from time to time but a few do not. 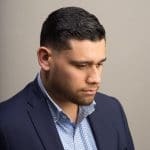 Consumer vs Professional Models – For most men, consumer beard trimmers are powerful and durable enough for daily or weekly facial hair upkeep. These models also tend to come with attachments that can be used for other types of grooming. 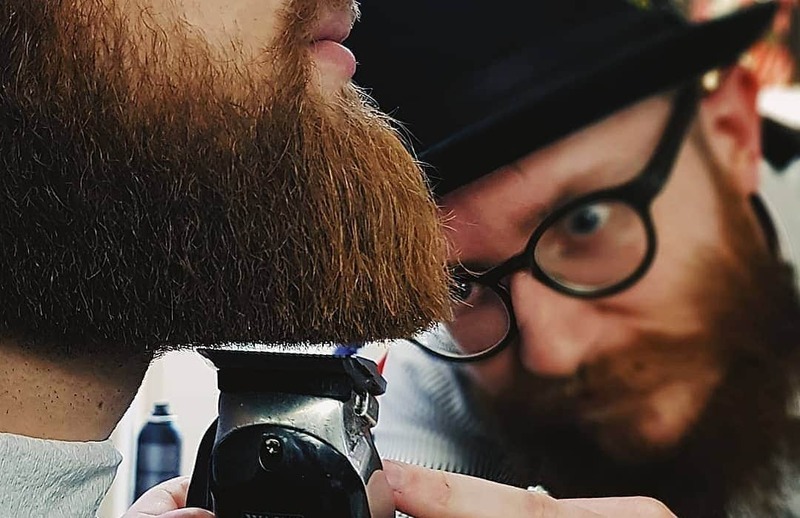 Barbers use their tools all day long, so professional beard trimmers are more powerful and precise but also heavier and often more expensive. They may also require additional purchases for clipper guards and more maintenance. On the other hand, they will last longer and have replacement parts. When it comes to professional clippers and beard trimmers, there are two brands that dominate – Wahl and Andis. For beard trimmers, Wahl is the only rechargeable trimmer that many professional barbers will use and the Wirecutter’s recommendation. 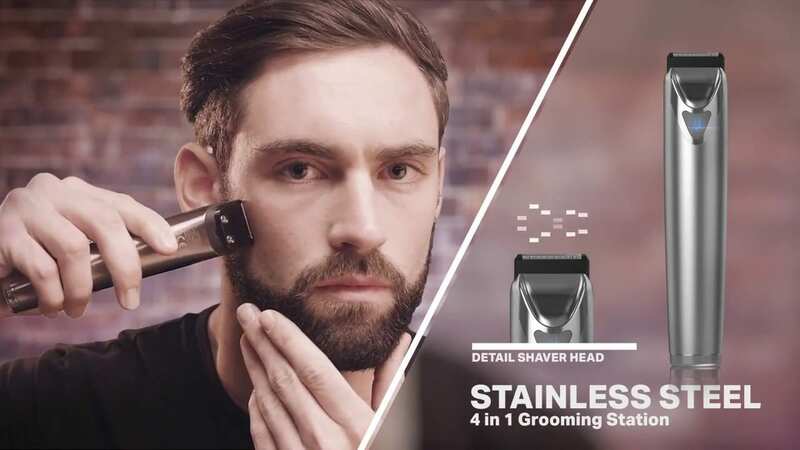 In addition to a sleek and sturdy all-metal body, the Wahl Stainless Steel Groomer has one of the fastest and most powerful motors available in a rechargeable beard trimmer coupled with self-sharpening blades. The Lithium-ion battery delivers up to four hours of power, with one hour of charge. 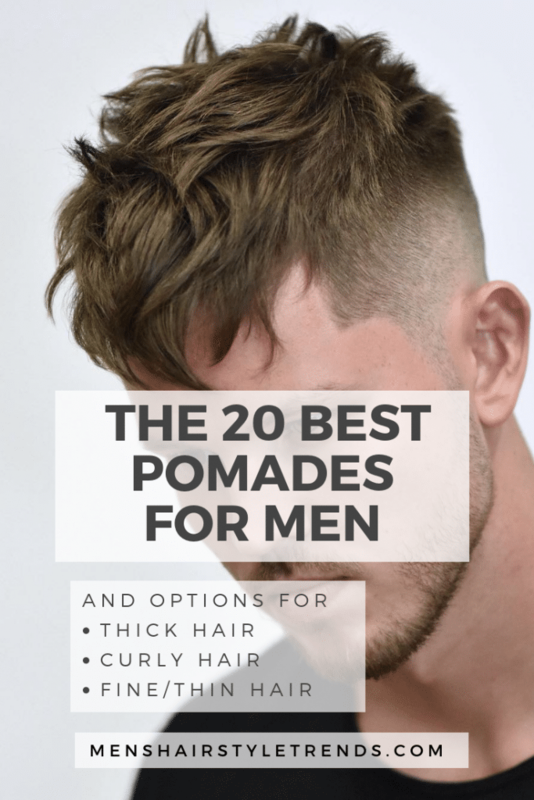 It also includes more attachments and clip-on guides than many shavers, with a detail shaver head, smaller detail blade, and rotary ear/nose head plus 12 guards ranging from 1/8″ (3mm) to 1″ (25mm). If you want to trim a long beard or cut hair with your beard trimmer, this Wahl has some of the longest guards available with a beard trimmer. Cordless trimmers can have issues but a five-year warranty and Wahl’s responsive customer service have got you covered. With a powerful engine, 12 accessories, and a price tag of $21, the Philips Norelco Multigroom 3750 is the best beard trimmer the least amount of money can buy. The powerful metal motor comes with self-sharpening steel blades that won’t rust, even when cleaned with water. In addition to a full-size steel blade, the Multigroom 3000 includes a narrow steel detailer, and circular nose/ear trimmer to clean up all the edges and more. Fiberglass reinforced cutting guards won’t bend or buckle even when dropped. A stubble guard plus 9mm, 13mm, and 16mm guards trim everything from stubble to longer beards or hair. 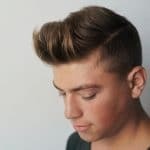 Try extending the life of a haircut by cleaning up hair around the ears and at the back of the neck. With 39 length adjustments, the Braun BT3040 has the most settings we have come across. That doesn’t mean it comes with 20 different clipper guards. Instead, it comes with just 2 attachments and a precision dial does the rest in 0.5mm increments. Use the beard comb for short facial hair up to 10mm and the hair comb for longer beards or hair from 11mm to 20mm. The stainless steel blades are supposed to offer lifetime sharpness. This Braun trimmer is dry use only but can be rinsed under water to quickly clean up. An 8-hour charge gives 60 minutes of run time. It can also be used corded. All that plus a 5-year warranty. If you’re hard on electronics, check out the Remington Virtually Indestructible Clipper. The rubber grip makes the device easy to hold while a polycarbonate case protects any dings or drops. It also includes a lifetime warranty. 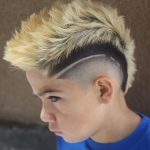 The powerful motor and precision ground blades can cut through the thickest hair smoothly. The 15-piece kit includes 1/16″, 1/8″, 1/4 “, 3/8″, 1/2″ , 5/8″, 3/4″, 7/8″, and 1” length-adjusting combs plus a beard brush, comb, and blade oil. This beard trimmer cut can stubble, long beards, and hair. Rinse this trimmer under water for easy cleaning. This only works plugged in but the 7-foot long cord ensures ample reach. Keep that sink clean with an integrated vacuum system that captures up to 90% of hairs while you trim. A turbo power boost button enhances cutting and fan speed. Just run the chamber and blades under water to clean. The vacuum isn’t a gimick. Philips Norelco makes excellent beard trimmers and this is no exception. In addition to the vacuum, a dial makes it easy to switch between 20 length settings from 0.5mm-10mm. The rounded contour comb gently guides the trimmer blades to follow the curves of your face and is gentle on skin. This maintenance-free device features self-sharpening steel blades that don’t require oil. A 60-minute charge provides 80 minutes of run time. 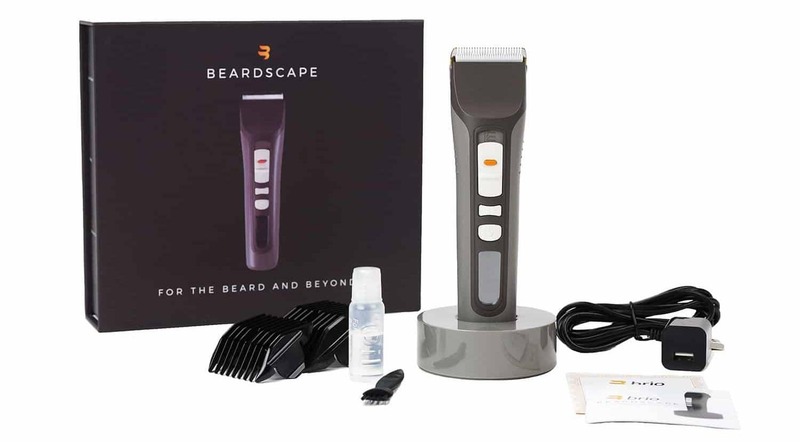 As the name suggests, the Beardscape trimmer has features that make is a great option for trimming long beards as well as shorter facial hair. It is one of the quietest trimmers available and also features five-speed settings for extra precision. The ceramic blade is 4 times harder than stainless steel, creates less friction and heat, and is quieter than metal. 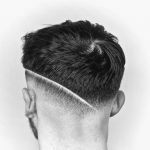 The trimmer has an integrated 1mm to 1.9 mm blade height adjustment plus 8 clipper guards ranging from 1mm to 18mm lengths. Use the Beardscape for stubble, long beards, anything in-between or any of your manscaping needs. The Lithium-Ion battery gives 4 hours of run time with only 3 hours of charging in an attractive stand. Conair i-Stubble + Conair Super Stubble. 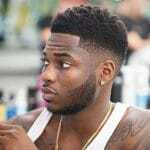 Stubble is the lowest maintenance look for men. It benefits sensitive skin because shaving is limited to cleaning up the cheeks and chin and works for thin or thick facial hair. To maintain ultra short facial hair, the best beard trimmer is the Conair i-Stubble or Super Stubble. Both models feature a floating head that follows facial contours for a smooth, comfortable shave between 0.4mm and 5mm of length. It also has a removable comb guide for detailing and trimming. The i-Stubble rings in at just over $40 and includes 15 digital settings, increasing blade length at .05m increments, can only be used dry, can be used with a cord or cordless with a 45 minute run time and takes 4 hour charge the Ni-MH battery. The Super Stubble is almost double the price at $82 but includes some valuable extras. It has 24 height settings, increasing blade length at .02mm increments. It is also waterproof and can be used in the shower and rinsed clean under water. This cordless trimmer includes a lithium battery that has a 70 minute run time and takes 80 minutes to recharge. Most beard trimmers come with clipper guards to adjust hair length. This 23-piece kit ranks the highest thanks to the volume and versatility of attachments. The Philips Norelco Multigroom 700 can be used for all your grooming needs thanks to a metal trimmer, foil shaver, detail metal trimmer, a nose and ear trimmer, an extra-wide hair trimmer plus guards for trimming hair, beards, stubble, the body and brows. This Philips Norelco beard trimmer also looks and handles well with a sleek stainless steel frame and rubber grip for control. However, none of the guards are adjustable. Changing length means changing the guard. If you know exactly what you want, this isn’t a problem but some guys prefer trimmers with dials or sliders that minimize the need to switch out guards. If you’re still interested, the steel trimmer has self-sharpening blades that don’t need oil, the reinforced guards are sturdy and never bend, and the trimmer can be rinsed with water. The Lithium-ion battery runs for 5 hours, takes 2 hours to charge, and can also be used plugged in. One of Panasonic’s best beard trimmers, this wet/dry option couldn’t be easier to use. Shift between 1mm and 10mm with 19 setting of the quick adjust dial, no attachments necessary. 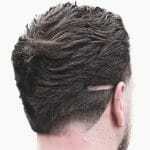 Get an even closer shave for the body by removing the comb. The waterproof beard trimmer can be used in the shower or at the sink and features a water drain for easy cleaning. The Ni-MH battery charges in an hour to provide 50 minutes of power. This is a good option for guys with shorter facial hair who like to groom in the shower. There are no additional combs so other trimmers are better for longer beards. 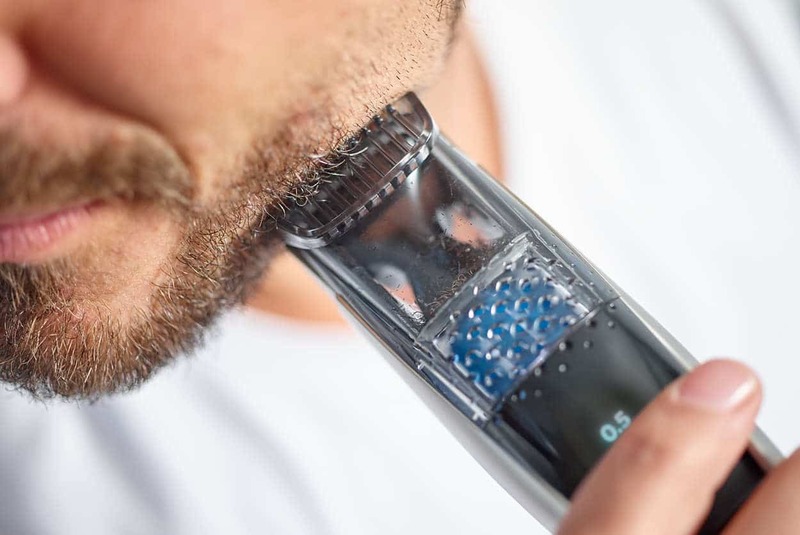 This beard trimmer won a Men’s Health Grooming Award. 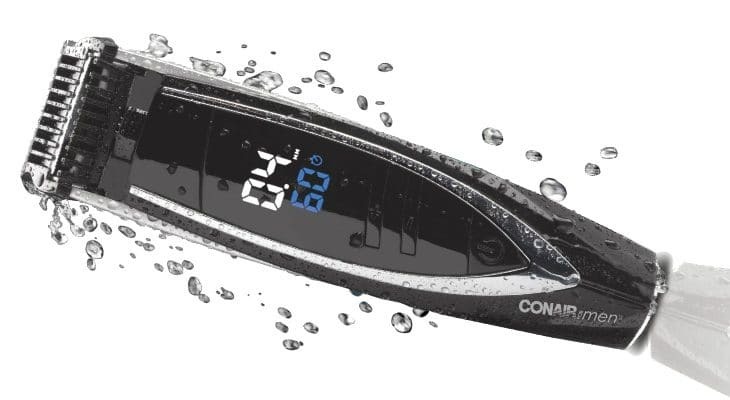 As noted above, the Conair Super Stubble is also waterproof. One of Wahl’s top selling professional trimmers, the Peanut is powerful and compact beard trimmer/hair clipper with a small price tag. As its name implies, it’s a small device that is light and easy to maneuver at only 4 ounces and 4 inches long. The simple design offers plenty of power, a close trim, and durability. Available in white or black, the Peanut comes with 1/8″, 1/4″, 3/8″, and 1/2″ cutting guards, oil, cleaning brush, and red blade guard. Extra power comes from a rotary motor and a corded clipper, with ample 7-feet of length. Like all professional trimmers, the unit requires oiling and new blades. The blade is detachable for easy cleaning and maintenance. How do I keep my beard short? With a beard trimmer or some hair clippers. Start with a longer guard than you think you need because there is no undo button for hair. Shave all over until you find a length you like. Finally, shave stray hairs at the cheeks and chin for a clean finish. This also sends the signal that stubble is on purpose and not due to laziness. Where should my beard neckline be? Start by looking straight in the mirror. You should not be able to see any hair the neck below your beard. Another guide is the Adam’s apple. 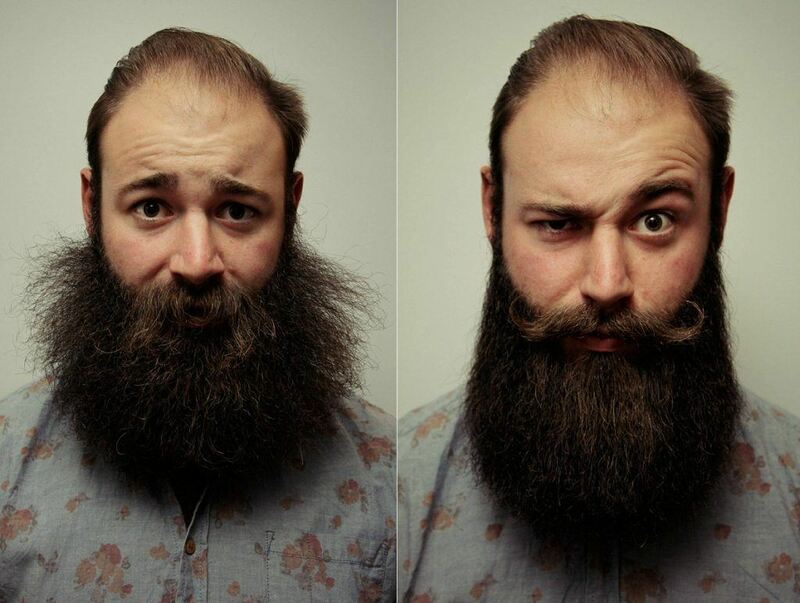 Place a finger just above it to find a natural dividing line between your beard and neck. Start here, trimming down from the center, moving out from the middle. Make sure to stay under the jawline. Finish the other side the same way. Aim for upward curve that isn’t too straight or too round. 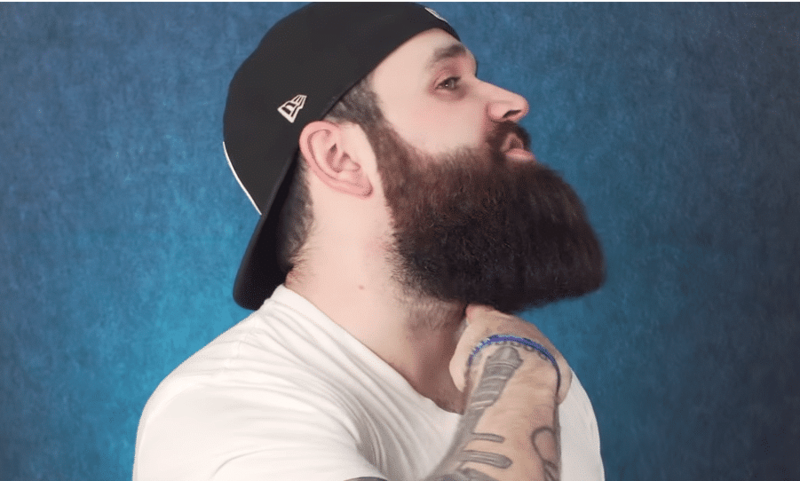 This picture from BeardTube shows how it looks with a fuller beard. 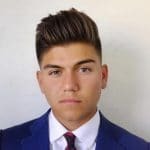 How can I make my beard hair straight? Beard hair tends to be coarse and bristly. Proper maintenance and good diet make facial hair softer and straighter. First, washing a beard is important. However, never use regular shampoo. 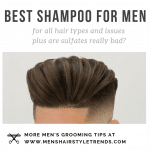 The scalp produces much more oil than the face so regular shampoo is much too drying for both skin and facial hair. Beard shampoos are designed to gently cleanse without stripping moisture. This is only required once or twice a week. Daily washing is too much. Towel dry gently. An old t-shirt can be softer and gentler on delicate facial hair than a regular towel. Another option is to blow dry the beard to really straighten it out. 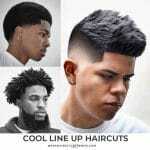 Keep the heat low and comb hair with fingers. 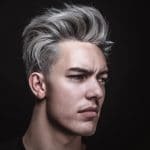 Like hair on the head, a hair dryer can create the most effective styles but isn’t absolutely necessary. 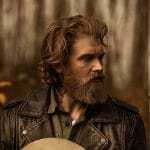 Now, apply a beard oil or balm to the dry beard, working product in from roots to ends. 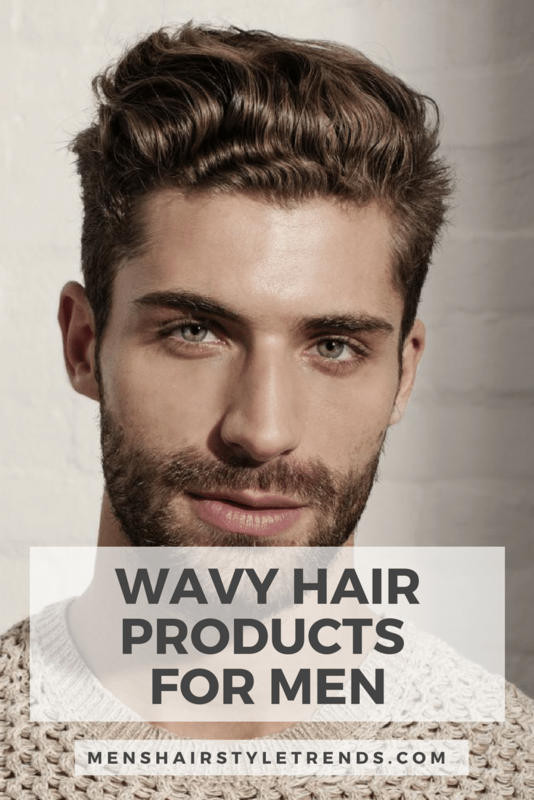 Putting product on wet or damp facial hair dilutes the product. In general, use a beard oil at night as a conditioner and beard balm in the day for shaping. 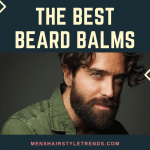 Beard balms contain beeswax for hold. Last, brush the beard with a Kent comb or beard brush. This will distribute the oil or balm evenly as well as straighten hair. Kent combs have smooth tines that won’t snag hair. Most beard brushes are made of boar bristle, which excels at smoothing hair. 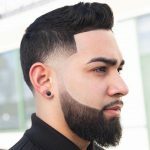 How do I evenly trim my beard? 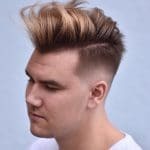 In general, go slow, focus on trimming the ends of hairs, and do one side, then other. If you’re new to grooming your beard, try trimming and shaping your beard in phases instead of just once. Wash facial hair after the first attempt to remove all little hairs and see how hair lies. First, with a clean beard, brush facial hair all in the same direction. Trim the obvious stragglers. Next, shape the sideburns and sides of the beard. 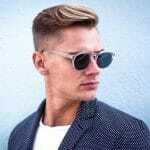 Continue to create the desired beard shape with clippers or scissors. Now work on the mustache area, whether it’s the same length as facial hair or longer. Now, touch up the lips to get rid of that flavor saver. Last, closely shave the neckline and cheeks. This is also a good time to clean up any stray nose hairs or brows. 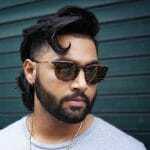 Should you trim beard with or against the grain? It depends. Trimming hair against the grain cuts more hair while cutting with the grain cuts less hair. 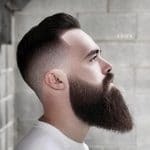 In general, longer beards should be trimmed in the direction of hair growth. 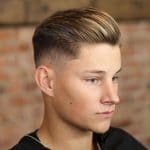 Shorter styles can be trimmed in either direction. 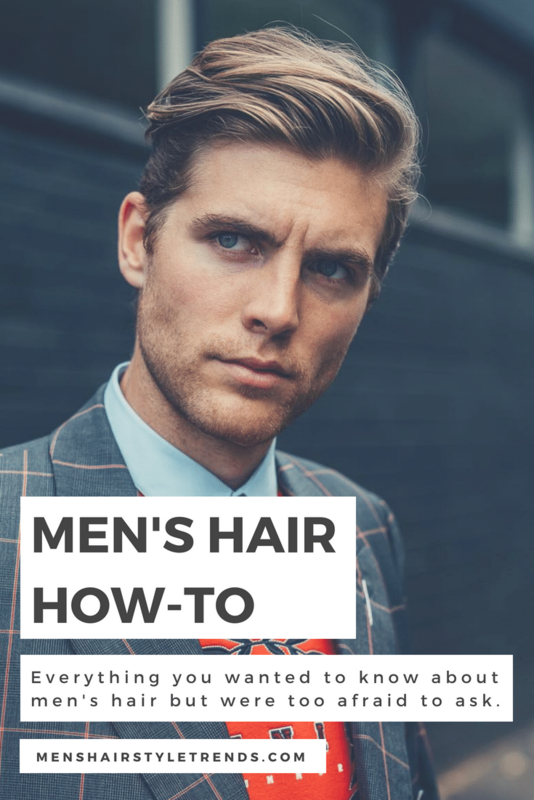 Of course, you will develop your own method over time so experiment with both to find what works for you and your facial hair growth patterns. How can I grow my beard evenly? Contrary to headlines, there is no way to grow hair faster or in places it doesn’t grow. 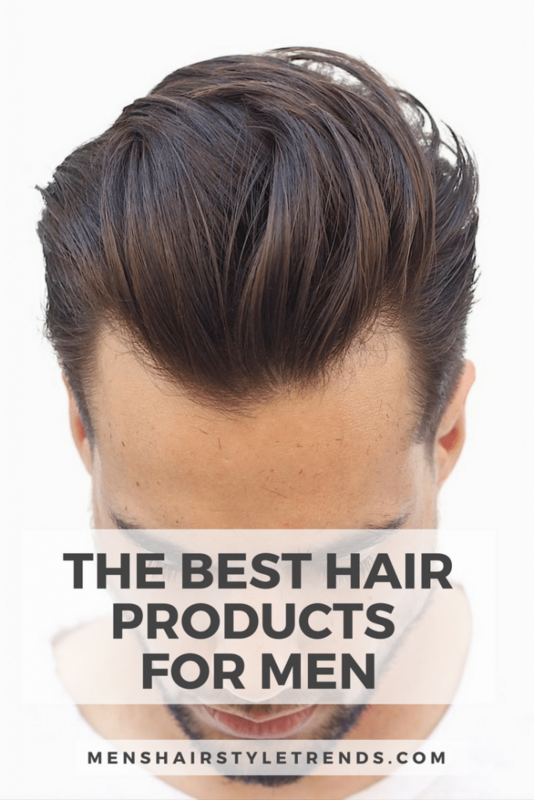 The best thing anyone can do for optimum hair growth is to eat well, drink plenty of water, and get adequate sleep. Beyond that, it’s up to nature. Growing a beard evenly requires patience and maintenance. First, do your best to leave facial hair alone. Try and resist the urge to stroke and pull the beard. 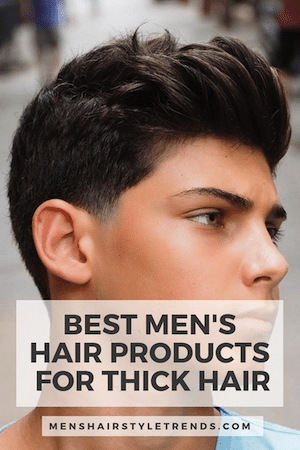 It damages the hair you are trying to grow. It also deposits anything that is on your fingers into the hair, and close to your mouth. Gross. Second, beards look best with some products. 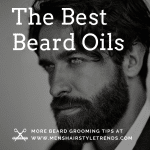 Beard oils won’t speed up hair growth but it will smooth and shape the beard and smells good. 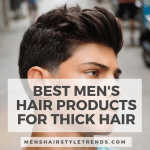 Most men do have a thin or bald patch or two in their beards. Embrace it. Areas with less facial hair can be covered up by long beards. For shorter beards, patches add character. Every man has his own unique beard shape and that is a good thing. Don’t compare your beard to others and make the most of the facial hair you do have. How do I shape my beard myself? Some guys prefer to shape their beard with clippers while others use scissors. If you do opt for scissors, invest in hair scissors, which are much sharper than scissors for paper. They cost a little bit more but won’t destroy your beard. 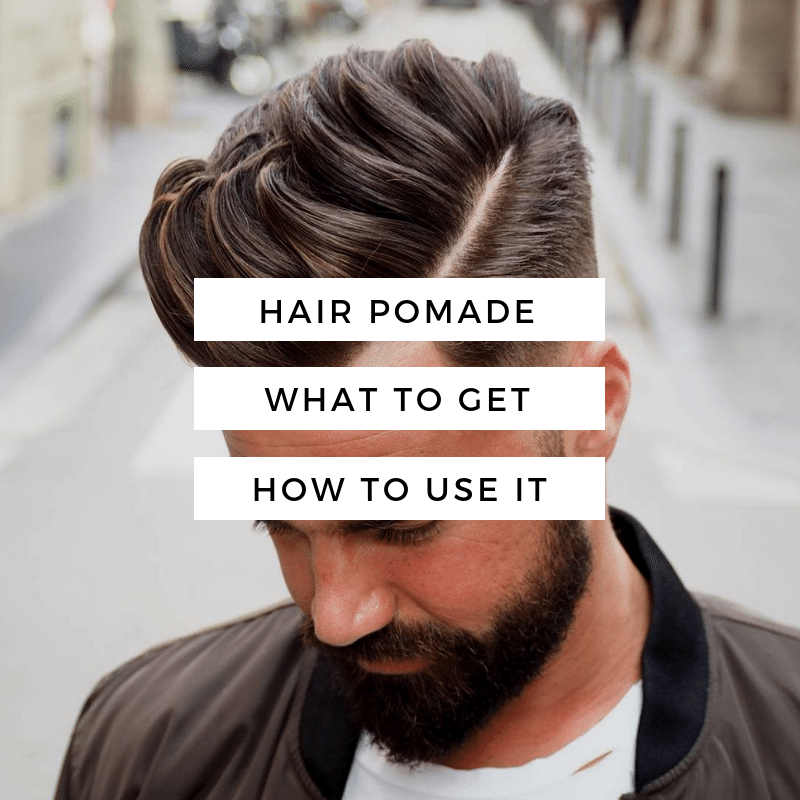 If you feel nervous about this, try visiting a barber for the first beard shape and then reproduce the results. 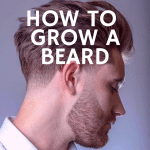 This is especially useful in finding your beard shape. Do you want a wide or slimmer beard, a round or angled shape? What kind of mustache? Youtube is also an excellent resource for beard shaping tips. With a beard shape in mind, start by cleansing facial hair with a beard wash. Dry hair and comb or brush hair in the same direction. 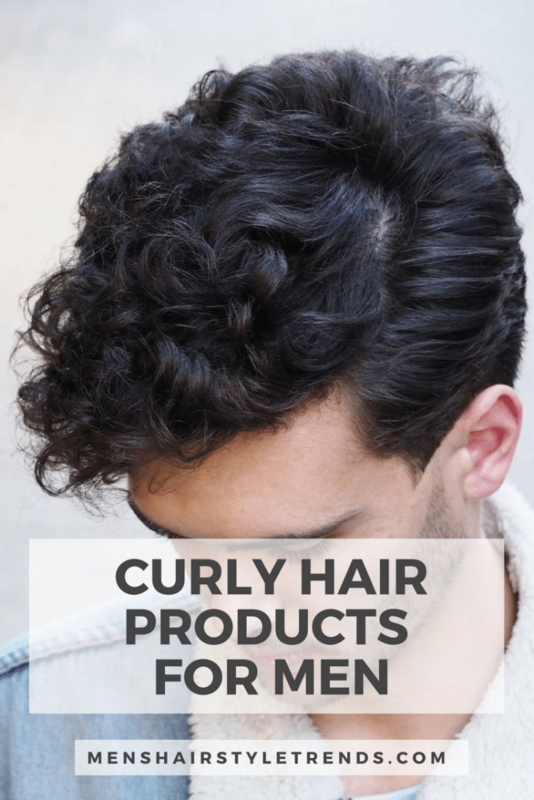 This ensures hair is in its natural state when you start. Hair shrinks when it dries so wet cutting may result in an unexpected shape and length. To shape a beard with clippers, start with a longer guard to avoid cutting off too much. For long beards, there won’t be a clipper guard for your beard length so you’ll just have to buzz down the edges. It’s a process that takes a little practice but never fear, that hair will grow back. Finish by trimming the sideburns and shaving the cheeks and neck.